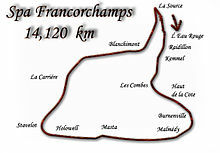 The 1968 Belgian Grand Prix was a Formula One motor race held at the Spa-Francorchamps Circuit on 9 June 1968. It was race 4 of 12 in both the 1968 World Championship of Drivers and the 1968 International Cup for Formula One Manufacturers. The 28-lap race was won by McLaren driver Bruce McLaren after he started from sixth position. Pedro Rodríguez finished second for the BRM team and Ferrari driver Jacky Ickx came in third. After the introduction of wings on an F1 car by Lotus at the previous race, the 1968 Monaco Grand Prix, this innovation was adopted by Ferrari and Brabham. Ferrari added wings to their lead driver Chris Amon's car and he nabbed pole position, and was 4 seconds faster in qualifying than the next fastest car of Jackie Stewart. Amon's teammate Jacky Ickx did not have wings on his car. The Brabham team also fitted a rear wing to Jack Brabham's car, paired with dive planes on the nose to counteract lift; he qualified 10th. Wings were added to Ickx's car (and many other teams copied the idea for their cars) for the next race at Zandvoort. On the seventh lap Brian Redman went off the circuit when his suspension failed and he crashed into and over a concrete barrier and into a parked car. His Cooper caught fire but Redman escaped with a severely broken right arm and a few minor burns. ^ "1968 Belgian Grand Prix". formula1.com. Archived from the original on 18 January 2015. Retrieved 26 September 2015. ^ Roebuck, Nigel (October 1998). "Legends". Motor Sport magazine archive. p. 18. Archived from the original on 10 August 2016. Retrieved 9 August 2016. ^ a b "Belgium 1968 - Championship • STATS F1". www.statsf1.com. Retrieved 12 March 2019.